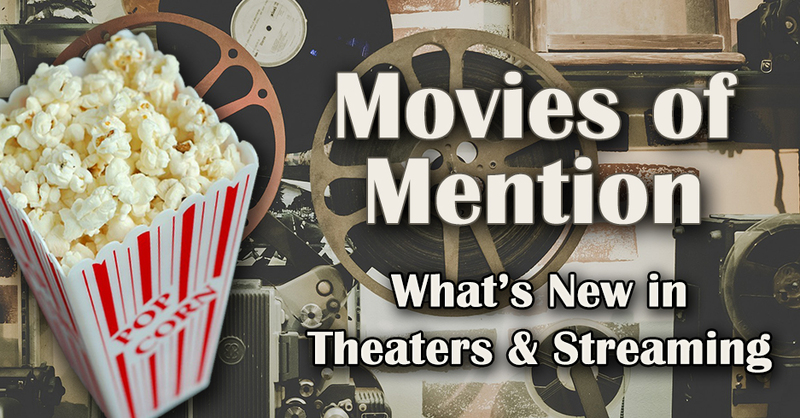 Welcome to your movie-geek roundup of what’s new and worth your attention on the big screen and streaming at home. Let us know in the comments what you’re going to be watching! Guy Ritchie’s wild take on King Arthur could stand to be more crazy. Sure, it begins quite fun with magic swords decapitating wizards, giant elephants blasting through armies, and a rather fast montage of Arthur’s life growing up in a brothel. It’s just too bad that the picture runs out of steam as it goes along, despite Charlie Hunnam not running out of muscle as the battle-ready Arthur. Jude Law makes a great villain of a king that wants Arthur completely out of the picture,but never gets to be truly evil as a lame CGI demon warrior steps in for his combat scenes. Hunnam’s supporting cast is strong but are never given much material to be as brilliant as these actors can really be. It’s a rollercoaster of a sword-and-sorcery epic that fluctuates between Ritchie’s trademark style of heist-worthy editing and the tired action sequences where swords are swung in slow motion against CGI backgrounds. Ritchie can do better than this, and I hope can make a strong movie in the future besides the five sequels planned for this franchise. The fourth film in the Wimpy Kid series finds the unlucky Greg stuck on a road trip to his grandma’s house. But when a video game convention nearby offers him the chance at being e-famous, he decides to secretly divert the trip. If you’re familiar with any, and I do mean any, overused tropes of the family road trip movie, you can set your watch to this underwritten, under-acted, and overly gross mess of a family comedy. The car breaks down, the family gets messy, they learn to bond, all that jazz sans characters you care about. This is also probably the most disgusting movie I’ve seen all year, with everything from vomit to poop to urine, some from different members of the animal kingdom. Parents, you have been warned, especially for a very cringe-inducing scene where Alicia Silverstone poorly sings a Spice Girls song twice. This independent horror of last year can only be described as a cross between a sleeper ’80s horror flick and Jumanji. Two brothers return to their dad’s old video store after he has gone missing for many months. When they open his office, they discover a VHS tape from one of those old board games which required the tape to play. They pop it in for a nostalgic lark, only to discover a scary lady telling them the only way to save their father’s soul is to play the game. So, yeah, like Jumanji, but instead of animals and floods coming from the game, it’s gory murder and demonic possession. Featuring loads of great gore, a synth soundtrack, and that ’80s magenta lighting, it’s a bloody good nostalgic throwback for anyone who grew up with ’80s horror. Andrea Arnold may be a British filmmaker, but she has a keen eye for this trashy American road trip. Sasha Lane plays Star, a teenage girl hoping to make some money on the road. She hooks up with a group of scam artists and quickly falls for one of the chief members, Jake, played by a strangely compelling Shia LaBeouf. You won’t see any over-the-top freak outs by LaBeouf, but you will see some of the best acting he’s done in quite some time. Newcomer Sasha Lane is not too shabby either in a film that gives her plenty of room to find character in her somewhat aimless world of scamming Middle America. Expertly shot and brimming with a relatable reality of aimless youth, American Honey leaves a lasting impression and is easily an undiscovered gem of 2016. René Laloux’s Fantastic Planet is easily the most trippy bit of science fiction, all the more weird and surreal with its experimental animation. Taking place on an alien planet, the blue giants known as the Dreggs look down on the tiny humans referred to as Oms, treating them as pets they can play with and pests that need to be exterminated. When one Om meets up with others hiding out in the forest, an uprising is formed against the Dreggs. That is, of course, if the Oms can survive the dangerous woods where all sorts of strange beasts want to eat them. The animation style, a mixture of cut-out and traditional 2D, gives the picture a very grungy and psychedelic appeal. The design of the Dregg society, from the strange methods of meditation to crystals that can be shattered with a mere whistle, is so weird and intoxicating to watch. It’s one of the few science-fiction films that feels truly otherworldly, especially with a swanky and ominous score by Alain Goraguer.